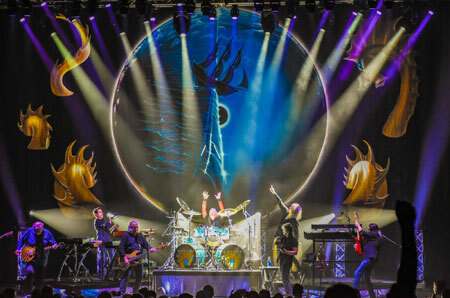 NASHVILLE, TENNESSEE – Bandit Lites is thrilled to once again light the legendary American rock band KANSAS as they expand the Point of Know Return Anniversary Tour with a spring leg. Named after the iconic, sextuple-platinum album, the 2.5-hour show features Point of Know Return performed in its entirety along with deep cuts and classics from their expansive discography. Lighting designer Scott Pearson is no stranger to lighting the band having crafted their stunning Leftoverture production. Bandit Lites provided Wildfire Blacklite WF 101 fixtures, Martin MAC Viper Profiles, GLP X4S fixtures and Elation CuePix WW2 Blinders. The band is also carrying an additional fourteen Elation SixPars to light the set pieces along with an Obsidian Controls M6 for control. And just like the previous productions, the Point of Know Return Anniversary Tour features three very distinct movements within the two and half hour show, meaning Pearson needed to program three different levels of looks.